A screenshot of the app zoomed in to a participating New Mexico Main Street district. MapMuse today announced the release of Main Street Locator, a free app that connects users with historic Main Street districts across the USA. Main Street, Inc. is a grassroots economic development initiative sponsored by the National Trust for Historic Preservation that helps revitalize commercial districts through preservation-based strategies. “We’re huge fans of historic preservation, and we commend Main Street’s efforts,” says Mike Pilon, owner of MapMuse. “Hopefully, the app helps attract a bunch of new visitors to the great places these programs are trying to promote and protect.” Main Street Locator is an interactive, map-based directory of over 1,000 Main Street communities. Users can browse maps of participating programs in search of cultural venues, entertainment venues, landmarks, restaurants, service provides, retailers, and accommodations. Each business and landmark has a dedicated profile filled with helpful information such as contact details (e.g. instant dialing and email), background information, photos, web links, and GPS-enabled driving directions. 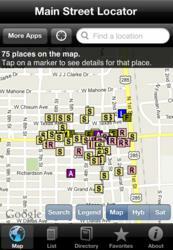 Main Street Locator can be downloaded for free from the iTunes app store. An Android-friendly version is currently in development. In the meantime, MapMuse has released a series of web maps that replicate the data found in the iPhone app. Main Street communities interested in adding their local listings to the app should seek out MapMuse’s table at the upcoming National Main Streets Conference in Baltimore, April 1st-4th. MapMuse, an internet and app development company based out of Reston, Virginia has been developing locator maps for the web and the mobile market since 2000. The company has made it their goal to provide the general public with maps of any topic that can be plotted geographically, and their website is filled with thousands of locators for various interests and brands. For more information on MapMuse, please visit their homepage at http://www.mapmuse.com. To download the Main Street Locator, please visit http://www.mapmuse.com/mainstreet.